Starting a blog in blogspot is pretty easy and free of cost. So the first time bloggers usually choose Blogger as the platform of their choice and and then shift to WordPress. As we all know that all blogs in Blogger and sub domains and some may not like long URLs. After creating a buzz you might start thinking about the importance of creating your own brand. At this point you may purchase a domain and point your Blogger blogspot blog to that domain without loosing content or traffic. You don’t need any server space. You can advertise on your site. 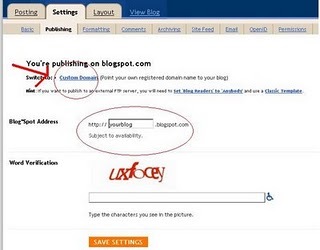 Almost every feature on WordPress can be implemented on Blogger. But if you want your own identity and features like custom IP, registration, forums etc. a purchased web space would be better- also there you have more control over your content. If your using Blogger, you will need to follow the strict rules and guidelines of Google (TM). Now we will start with Blogger custom domain. 1. Go to your Blogger the dashboard and select the blog you want to be used with a custom domain on Blogger. 2. Open publishing from settings tab. 3. Select custom domain as indicated in screenshot ( click on image to make it larger) . 4.If you already have a custom domain registered, then you can switch to advanced settings. If not, check availability for a custom domain in the box provided and proceed to online payment with Google checkout or credit card. 5. 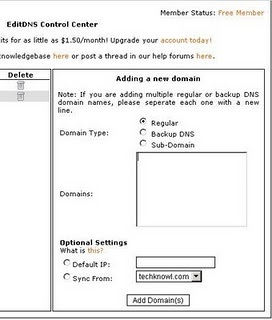 In the advanced settings, as shown above, you can enter your domain details. Remember to prefix it with “www” for correct domain mapping. Continue with the word verification and save the form. 6.Now tick the check box that appears just below the space where you entered the domain name. This is important as this option automatically forwards http://yourdomain.com to www.yourdomain.com. That was everything in the Blogger settings section. Now you have to point your custom domain to Blogger or Google servers. This is pretty easy for people using premium domain registrars like Godaddy.com as their control panel offers DNS and domain re- routing (Total DNS control). 7. In DNS control you have edit the CNAME records. If they are not present, you have to create one by providing your domain name and IP/host as ghs.google.com ( This is important). 8.You can create similar CNAME records for adding any sub domains. For eg: www.subdomain.yourdomain.com Ip/host: ghs.google.com don’t change any other values. 9.Furthermore, there is MX records for email forwarding. Save the settings and wait for 48 hours for complete domain transfer and propagation over internet. After domain propagation, your blogpost blog will be re-directed to new custom domain. You don’t need to worry about your old traffic and search engine positions. 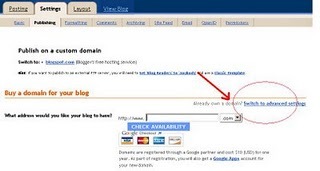 Just verify your blog in Google webmaster center and submit a Blogger sitemap. 10.Now if your registrar doesn’t support DNS forwarding ( resellers and local registrars won’t support this ), you can use free DNS hosting services like that provided by editdns.net. 11.Firstly you have to transfer your domain’s nameservers from your control panel to editdns and then to the Google servers using editdns. So here editdns performs the role of a DNS re- router, editor and mail forwarder for registrars who are not supporting inbuilt DNS forwarding. Now change them as ns1.editdns.net, ns2.editdns.net,ns3.editdns.net and save the settings. So now your domain is pointed to editdns.net . 14.Register with editdns.net and verify your account. Enter your domain name with out “www” as shown here and click add domains. Now the added domain will be shown in red until your domain is completely forwarded to editdns servers. It would take at least 24 hours for the complete propagation. 15. After propagation, from the left tab of Editdns control panel, select a domain name that is to be forwarded as Blogger custom domain. It will lead you to the following page. 16. 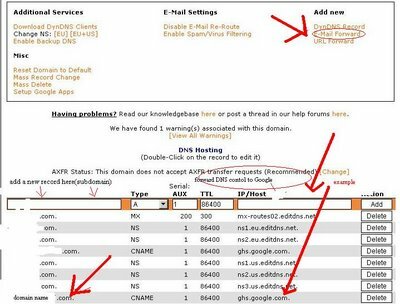 Double click on CNAME records and change IP/host as ghs.google.com. If there is no CNAME entry, add one on the blank box and select the type as CNAME.You don’t need to change AUX and TTL. 17. Each time when you add a sub domain, you have to create a new CNAME record. 18. There is also an option for email-forwarding (Click on Email forward ). Enter something like admin@yourdomain.com and a email address to which the mails are to be forwarded. 18. After this, you have to wait another 24 hours for complete domain transfer. Have enjoyed this tutorial for Blogger custom domain?? Share your thoughts and doubts in the comments section. editdns.net is not free now is there any other secure and reliable. Thak you for this great article.. I bought a custom domain from google for my blog. Am I able to also use it for email like info@(customdomain).com? I hosted my site in blogger with a custom domain but with my friend’s computer IP address, i can’t get into my site. but with proof IP i would able to see my site, i thought the problem with browser (I checked with Google Analytics) but almost all browser visitors came to my site.I don’t know what is the problem. Is the problem with my Server or Browser?